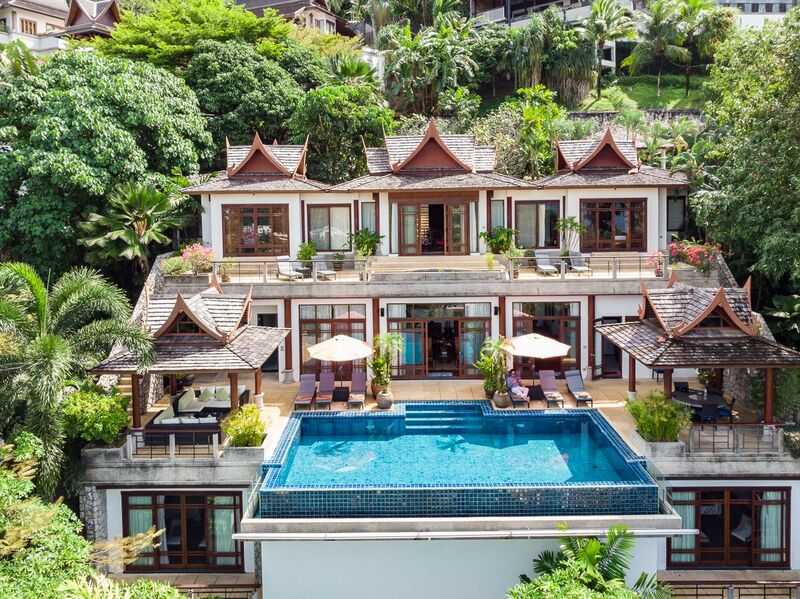 A cruisy 30-minute drive from Phuket International Airport, Villa Arawan is perched on a serene clifftop with sweeping views of Surin and Bang Tao beaches on the west coast of Phuket. Located within the private Ayara Surin estate, the property has its own gate at the end of a no-through road and has been cleverly positioned to appear out of sight from other surrounding villas, leaving you with a private slice of paradise. Despite its tranquil location, a short 10-minute drive will land you at some of the best restaurants and chic beach clubs in Surin and Kamala—including Café del Mar, Catch Beach Club and Bocconcino— far from the rowdy crowds of Patong. Built by the same contractor involved with the prestigious Amanpuri and Banyan Tree Phuket resorts, Villa Arawan boasts Northern Thai style elements met with clean, modern lines and an earthy palette. Entering the private gate, guests are greeted by a pond surrounded by lush greenery and tropical flowers, with "floating" concrete steps leading to the villa's dramatic carved wood front door which opens to the top floor of the villa. It's instantly impressive, as you're greeted by large windows that open up to expansive views of Phuket's west coast. The large foyer houses to two generously-sized master bedrooms, and in the middle of the foyer is the opening to a spiral staircase that leads to a large, airy living space. Combining a living room and dining room, it opens up to Villa Arawan's pièce de résistance; an infinity pool that flows over the cliff. Pagodas sit on either side of the pool, one with a dining setting and the other with comfy lounge chairs for reading, napping or simply enjoying Phuket's psychedelic sunsets. The matching master bedrooms located on the top floor each boast king-size beds, a private terrace with sweeping views and a luxurious en-suite bathroom with a handmade bath and separate shower stall. Two floors down are the three remaining en-suite bedrooms—including one very large multi-purpose bedroom that includes a TV, games and soundsystem—which is perfect if you're travelling with kids or young adults, as it allows them to take over their own part of the house while parents enjoy peace and solitude upstairs. All rooms at Villa Arawan look out to lush views of the Andaman Sea. Enjoy having an in-house Thai chef to make whatever your heart desires for breakfast, lunch and dinner. Menus are shared prior to your visit so you can pre-plan meals, or if you prefer to play by ear, just tell the villa manager what you're in the mood for and she'll arrange it with the chef. Villa Arawan's in-house chef is a sweet, motherly-like Thai lady and upon meeting her, you just know she's the type who can whip up something fierce in the kitchen; from a light lunch of pad thai and satay to a luxurious Thai-style seafood BBQ with homemade sauces enjoyed by the pool during sunset. Villa Arawan's fantastic villa manager is comparable to a five-star hotel concierge. Seeing no request as too big or too small, she can help arrange everything from restaurant reservations to private elephant sanctuary tours and in-house Thai massages.